Together we can make sure the West Gate Tunnel project delivers a good outcome for bikes. Melbourne’s West Gate Tunnel project has been in planning since 2015. In November 2015, the Victorian Government announced a series of major road projects – the Monash Freeway, Web Dock upgrades and the Western Distributor, which would become known as the West Gate Tunnel project. At that time, the $5.5 billion package included just 4.5 kilometres of bike and pedestrian paths, an embarrassingly small amount. It now includes more than 14 kilometres of network improvements. Since the initial announcement, Bicycle Network has been working with the Victoria State government to make sure the West Gate Tunnel project includes bike infrastructure that removes dangerous road crossings, improves connectivity and separates people who ride from heavy vehicles. The project is due to be completed in 2022. The Western Distributor project was announced alongside other road projects costing $5.5b but with little bike infrastructure. At this stage, opportunities for the project include the removal of thousands of trucks from local streets in the inner West. A number of options to complete to Federation Trail were put forward – at this point the only guaranteed piece of bike infrastructure as part of the project. Bicycle Network submitted a number of priority bike infrastructure facilities for consideration as part of the project. New designs showed a new Footscray Road bike path that would take riders from Shepherd Bridge, over the Maribyrnong River and all the way to Docklands without traffic lights or intersections. The whole path would be grade-separated from roads and railway lines. This means no more risky crossings of the Sims Street loop at Shepherd Bridge, no more hold ups at Dock Link Road (to be closed as part of another project) and no more dicing with slip-laning trucks at Appleton Dock Road. Bicycle Network CEO, Craig Richards described the plans as a vital boost to bike riding in a long neglected area. “Melbourne’s western suburbs have never had enough attractive facilities that get people out on bikes and commuting to work and getting healthy. “By providing these great facilities as part of major projects, we can accelerate the rollout of this much needed infrastructure and save the community money. “The State Government and Transurban have recognised that bike transport is every bit as important to Melbourne as motorised travel is, and that bikes are entitled to their share of first class infrastructure”. A suite of further pieces of bike infrastructure were announced as part of the project, which is now known as the West Gate Tunnel. This included a new bike bridge over Whitehall Street at Yarraville Gardens and an elevated bike freeway above Footscray Road dubbed the Footscray Road Veloway, plus a number of other upgrades to nearby paths and trails. Contracts for the project will be signed after the Environmental Effects Statement process is successfully concluded around the end of the year. Several of the groups bidding for the project invited Bicycle Network to confidentially discuss proposals for bike infrastructure facilities that could be included in their bids for the mega-project. 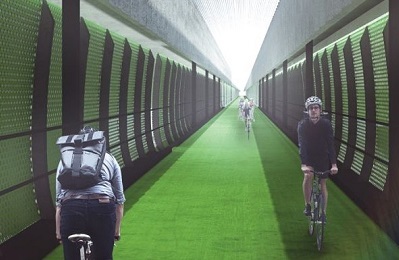 The release of the West Gate Tunnel Environmental Effects Statement caused concern over the Footscray Road Veloway after artists impressions showed potentially sub-standard facilities. However, the illustrations were not final designs and actual plans will include proper facilities. When detailed design gets underway we will be consulted and will work to ensure that all the appropriate design outcomes are met. Bicycle Network called for calm after there was more conjecture about the design of the Foostcray Road Veloway based on artists impressions in the Environmental Effects Statement. Bicycle Network made a submission to the Environmental Effects Statement. Read our submission. Bicycle Network speaks at the independent Inquiry and Advisory Committee (IAC) public hearing on the Environment Effects Statement (EES). The EES will inform decision-making on the West Gate Tunnel Project under Victorian legislation. Work on the West Gate Tunnel project stopped for less than 24 hours this week when the Coalition and the Greens blocked it in the Parliament. Bicycle Network is working to make sure the bike aspects of the West Gate Tunnel project are well delivered. The West Gate Tunnel project will deliver more than 14 kilometres of new and upgraded bike and pedestrian paths. Construction is expected to start in 2018 and be completed by 2022. Click here for a fact sheet with information on all plans for bike infrastructure as part of the West Gate Tunnel project. Bicycle Network will continue to work with the State Government and all stakeholders to ensure that the needs of people who ride bikes in Melbourne’s West are met. Bicycle Network has made a submission responding to the West Gate Tunnel Environmental Effects Statement and discussing its involvement in the project. This submission was discussed with the West Gate Tunnel planning panel in September 2017. Bicycle Network has been and continues to be well consulted on key elements of the project, including the crucial importance of keeping bikes and trucks separate and grade separation at locations where bikes and motor vehicles cross paths. Bicycle Network’s Environmental Effects Statement submission noted that the overall impact of the West Gate Tunnel Project for bikes is positive. The project will remove trucks from many roads that bike riders must use, deliver new infrastructure and improve the existing network including the Moonee Ponds Creek, Kororoit Creek and Federation trails. As projections for the project indicate potential traffic increases in inner Melbourne, the West Gate Tunnel project should be used as an opportunity to continue policies of prioritising public transport and active transport, and de-prioritising motor traffic in the inner suburbs. As new bike routes part of the project are along a major road corridor it is arguable that bike riders could be exposed to pollution created by the project, however there are already bike routes that exist alongside these roads. Until detailed plans are released, not just examples and illustrations, the distance between bike paths and roads is unknown. However, it seems that the distance will be greater than that between existing paths and roads and that pollution should not be an issue for bike riders.